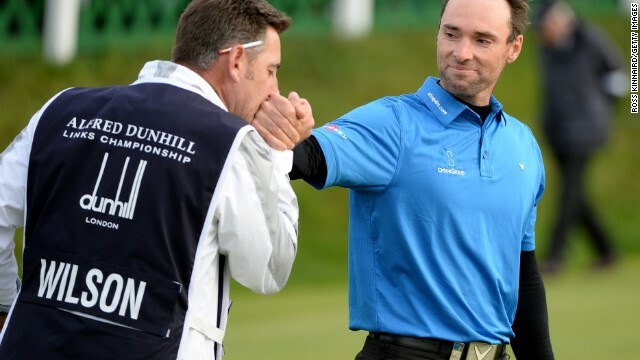 Oliver Wilson has provided one of the feelgood sports stories of 2014, having gone from golfing despair to delight in the space of a week. A former Ryder Cup player, he was no longer a member of the European Tour, scratching around to get tournament invites in order to compete. But it turned around in the space of four glorious days at St. Andrews, as Wilson sealed a one-shot victory ahead of world No. 1 Rory McIlroy -- one of three players tied for second. It was a tearful reunion with his wife Lauren, who unbeknown to him had flown up to Scotland to watch him secretly on the final day. 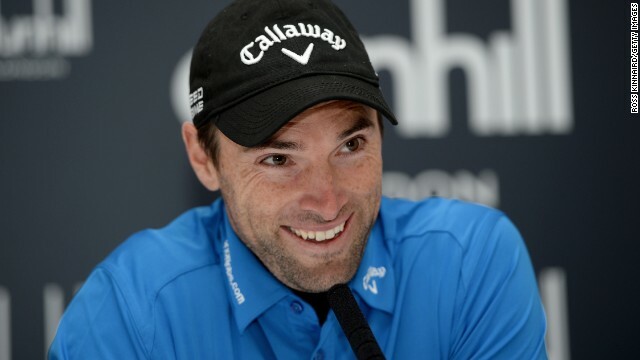 It was Wilson's first European Tour victory in his 228th tournament. Understandably, he was all smiles afterwards and admitted to having a sore head the morning after his celebrations. Wilson joined the European Tour in 2005, but his biggest season came three years later as he lost in a playoff in its flagship event, the BMW PGA Championship at Wentworth. 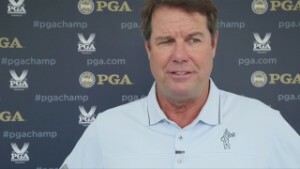 Wilson and his partner earned a trip to Valhalla that year as he played for Europe in the Ryder Cup, winning one match and losing the other in his debut against the U.S.
Wilson was an unlucky loser for the fourth time in 2008 when he lost a playoff to Sergio Garcia at the HSBC Champions event in Shanghai. It was his eighth second-placing on the European Tour and he would add another near miss when he tied for second at the 2009 Alfred Dunhill Links Championship. (CNN) -- It's the dark days that Oliver Wilson remembers most. The phone calls with his psychologist where the tears flowed, the moment his wife Lauren sat him down and told him he could give up the game of golf, that he had nothing left to prove. He boasted an unenviable place in the record books: the most runner-up spots in European Tour history without a win, having finished second nine times in 227 tournament starts. And then there was the accolade of being the only Ryder Cup representative -- he played for Europe at Valhalla in 2008 -- not to have won a title. However, in a career of unlucky numbers, the Englishman will forever remember 228 -- which marked his long-awaited breakthrough victory and the lifting of a cloud of depression that threatened to end his playing days. Don't think I could've chosen a better person to finish 2nd to this week! Congrats @Oliver_Wilson so well deserved! 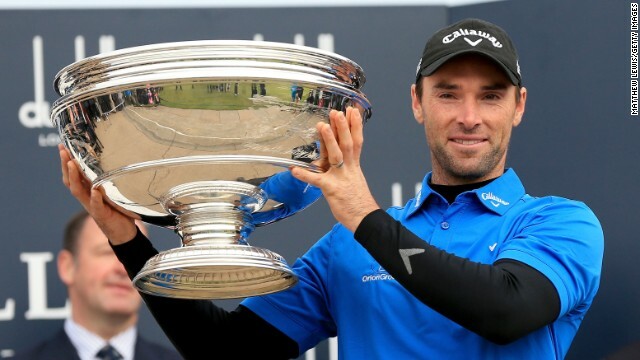 It came this month at St. Andrews, as the 34-year-old held off the world's best player, Rory McIlroy, to win the prestigious Alfred Dunhill Links Championship and rocket 636 places up the world rankings from 792nd. As he walked down the 18th fairway at the home of golf, running through his mind was the thought that he would soon be hearing from the legendary Gary Player, a nine-time major winner with a propensity to tweet each weekend's big tournament winner. For the first time in Wilson's life, he was the social media recipient. He calls it a "Cinderella story" and it is just that. Tiger Woods is friends with WHOM? 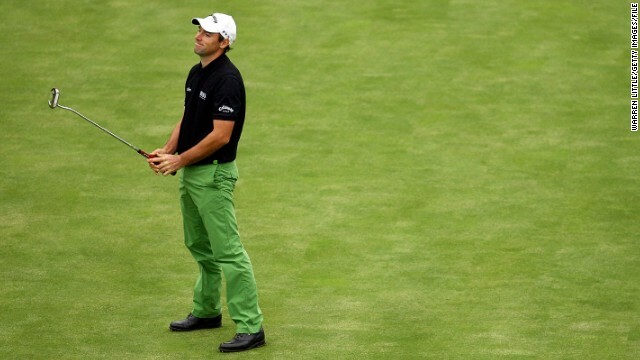 Things started to go horribly wrong when he missed qualifying for the 2012 European Tour by a single shot in Wales. He returned to the locker room and burst into tears. "There were some very dark times," he says on reflection. "Last year was very rough on us (Wilson and his wife). It was hard, very stressful at home." Wilson was shelling out money just to play golf. He estimates that, prior to St. Andrews, he had spent about $120,000 over two years merely traveling to tournaments -- and banked barely half of that before tax from a smattering of prize money. He is not looking for sympathy -- after all, he admits he is unlucky enough to have banked enough money from past results to be financially secure. "I remember Lauren said to me, 'It's okay if you don't want to do it and don't enjoy it.' And I hated it. I didn't want to go and play," he says. "I worked harder than ever before in practice and in the gym, and it only made it worse. In some ways being at events was easy. The pressure was off, I knew I'd turn up, play two rounds, not make the cut and go home." Until St. Andrews, where in 2009 he tied for second with McIlroy at the same event, Wilson had not carded a single round under par in two months. Perhaps a tad ironic for a golfer who had hit rock bottom, it was fellow European Tour professional Robert Rock that came to his aid. Rock sent a lengthy email missive detailing his compatriot's swing, likening it to that of McIlroy and Tiger Woods, and highlighting where he had gone wrong with it. 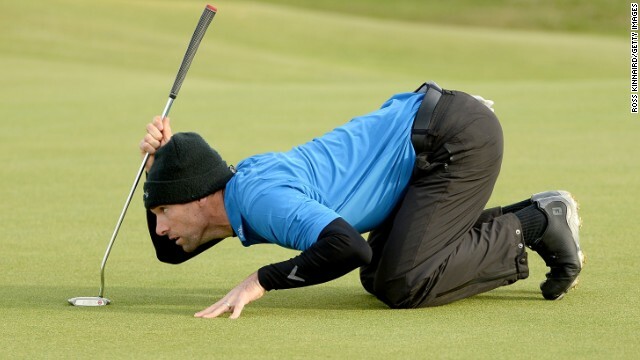 With the new tips on board, Wilson put them into practice the following day and immediately broke the course record, albeit at a second-tier European Challenge Tour event in Kazakhstan. "I thought, 'We could be on to something here.' I owe it all to him," Wilson says. He was not able to follow up his success at last weekend's rain-shortened Portugal Masters, where only two rounds were possible, but he has had time to reflect on the $800,000 pay check -- which took him past $8 million in career prize money -- and what it means for him. 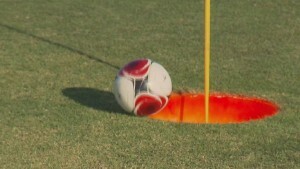 You can do THIS on a golf course? For one thing, he has secured his place on the European Tour for the next two years, and entry into two World Golf Championship events. Wilson had always said his aspiration was to buy an Aston Martin when he won a tournament. Now it has happened, he does not intend to be so frivolous. For him, the money is not the key thing. "I'd always dreamed of winning at St. Andrews -- the (British) Open or the Dunhill Links Championships -- but this time it happened." It will go down as one of the most popular victories of the season, all and sundry tweeting and texting to pass on their congratulations to one of the sporting feelgood stories of 2014. McIlroy -- the man he pipped to the title -- was among those to congratulate Wilson, as well as European Ryder Cup star Ian Poulter, who tweeted: "I can't tell you how happy every player on Tour will be for Oliver Wilson winning the Dunhill Links. It's been a long road back." Aptly, the tournament ended in him driving away from St. Andrews in a Skoda while the world's golfing elite took off in their private jets. But now he says he feels he can "take on the world" -- a far cry to the past two seasons when he needed a psychologist to "keep me going while I was breaking down over the phone. I didn't know what to do." That he was at St. Andrews at all was somewhat fortuitous -- Wilson needed a late invite from the organizers. "I was nervous on the Saturday but not on the Sunday until the final two holes," he recalls. "The big thing was making a four on the 17th, I'd avoided the big danger. I remember hitting the three wood on the 18th and I just didn't have any feeling of how it was, like you normally would. "It was the same with the approach, there was just no feedback -- it was bizarre. I thought I was set for another playoff (he has lost all four he has been in) but Tommy Fleetwood's putt slid just wide and that was it. I was in bits." Unbeknown to him, his wife had traveled to Scotland to watch his final round, and Wilson only spotted her as he left the final green. "I'm glad I didn't know she was there until then," he says. "I remember I was looking at the ground as I was crying but then I looked up and she appeared. That was amazing, to know she'd had that belief in me to come up there. "I think a lot of people think golfing wives are trophy wives but we're a team and she's been through it all. She's been a massive influence." Wilson's golfing roller coaster is finally back on the upswing. At his previous peak six years ago he was a member of the last European team to lose the Ryder Cup, but he did not foresee how his fortunes would plummet. "I felt incredible, like anything could happen," he says of that time. "I saw other players struggle and I thought, 'That won't happen to me.' "
But then it did and he feared he would never get his game back. However, he is now targeting a place in the European Tour's top 30 and the hope of playing at his first major tournament since 2010. 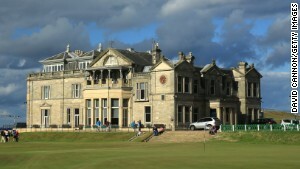 After all, next year the British Open will be held at his new lucky course -- St. Andrews. Read: Is this the ultimate hipster sport? Read: What can dolphins teach golfers? If golf has a reputation for being a bit stuffy, then the Bryan brothers and their trick shots are a much-needed blast of fresh air. Not many people make the leap from teenage market trader to golf pro and fashion entrepreneur, but that's just what Ian Poulter has done. "Sleep, as far as mental and physical recovery goes, has never been more important ..." says sport sleep coach Nick Littlehales. Joe Miller is devouring his second steak of the day and the clock has barely nudged 2pm. You need lots of fuel to smash a drive 474 yards. The feelgood sports story of 2014? 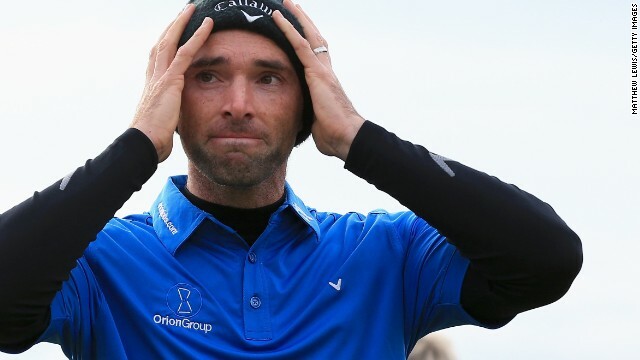 There have been many dark days for Oliver Wilson, but golf's unluckiest loser is finally riding an upward swing of his career roller coaster. Is this the ultimate hipster sport? They dress like it's the 1930s and they swing antique equipment that eschews cutting-edge technology -- this is hickory golf. CNN's Living Golf focuses on women's golf, charting the growth of the sport from royal pastime to multi-million dollar machine. "I don't know how to paint happy," says golf's poster girl Michelle Wie. "I think it releases a lot of the darker feelings in me." If you're a U.S. golf fan, or Tom Watson, look away now. A ban on uploading social media pictures from the course at Gleneagles was dropped for the Ryder Cup. A spot of shopping, the odd spa day and some serious flag waving. Welcome to the life of a Ryder Cup WAG. Tom Watson has learned plenty in the 21 years since he was last U.S. Ryder Cup captain, but social media is proving to be problematic. Do you love the U.S. THIS much? Patriotism will reach fever pitch when the USA and Europe collide in golf's Ryder Cup ... and it looks like Rickie Fowler has let it go to his head. Pressure is inescapable in the cauldron of Ryder Cup competition -- pressure and ping pong. Millions of golf fans were watching on television with great anticipation. All Martin Kaymer could think about was getting his phone out.